TO THE AIR, WIND AND SUN Breathe there a man who would refuse to be dashed against the rocks of this Lorilei! 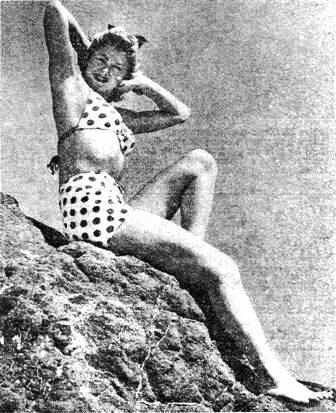 This vision is Esther Williams, exposing her charms to the air, wind and sun - as if you didn't know. Following the close of the I-BT on May 31, there will be activated on June 1 the Detachment, U.S. Army in India (USAI), under Col. Sumner Waite. The old Theater area from Karachi to Singapore and from Columbo to Chabua will remain under the jurisdiction of the Detachment. Once occupied by over 175,000 personnel, this area will now find only about 150 officers and men. The Theater started and carried along the job. It will be the duty of the Detachment to complete the work, said Col. Waite. Much of the work started by the Theater will be completed by June 1, but some of the work was impossible to finish in so short a post-war period. This work consists mainly in Graves Registration, Claim Settlements, War Crimes, Procurement, Disposal of Fixed Installations, Port Operation, Liaison and Records. The war crimes and procurement should be finished within a year, but the graves registration and claims might continue to three years, said Waite. The 150 officers and men who will compose the Detachment are mostly drawn from volunteers and the regular Army. There is a small group of men with an essential MOS, not eligible for discharge under Circular 66, who have been interviewed for work here. Many of the men eligible for discharge will be released from the Army and enter the foreign branch of Civil Service. Thus, they will carry on their work in a civilian status. The USAI will be as complete and offer the men as much as a unit of that size can possibly undertake, Waite said. Many special service features such as the magazine kits and the armed service editions will continue as in the past. The Detachment has taken over an ample supply of sports equipment and whatever else will be required will be requisitioned from the States. The men will be on per diem, and there will be a co-operative mess available in New Delhi, stated Waite. There will be equivalent facilities available for officers and enlisted men. As in the theaters of occupation, provisions are made for the men to have their wives and children brought to them. Waite has asked his men to wait and see the accomodations that can be made available for them, and to reconsider the advisability of bringing their loved ones here at this time. As yet, no one has made application. The Detachment men stationed in Calcutta will be quartered in Camp Knox. The camp is offering the men individual rooms equipped with radios. "This is certainly the best Army chow I have ever eaten," said Sgt. Ira Bolden, in charge of the motor pool. The camp is trying to arrange for a guest room to entertain friends, continued Bolden. Headquarters, USF, IBT, and Headquarters Company, Base Section, began their processing Monday for the Marine Jumper, final ship to leave the Theater, still scheduled to depart for San Francisco May 31. Theater troops also returned to "soldiering" again as 6:45 reveille was instituted Tuesday morning. All bearers and sweepers were dismissed from Camp Dhakura also, so the men returned to Stateside Army routine of policing the area, making beds, shining shoes, roll calls, etc. All I-B personnel are reminded to utilize their June PX ration from May 15 to 20, Maj. Frank Keefe, Chief of Army Exchange Service, said this week. All post exchanges within the Theater will close May 20 in order to close out their books in time for the Marine Jumper departure. Exchange facilities will be available to personnel remaining here after the Theater closes May 31 through Quartermaster Sales stores which will open probably once or twice a week, Keefe said. Most of the regular items such as beer, cigarettes, will continue to be sold with the exception of toddy, shoes, Wittman's chocolates, and other Stateside-purchased items, Keefe explained. No beer will be permitted aboard the Jumper nor will anyone take any 3.2 aboard with them, Keefe states. It is definitely against Army regulations. However, a number of PX items will be available on the Jumper in the ship's store for troops, says Keefe. I-B Claims Section Handles Unusual Cases Against U.S. The officers latrine was in flames. It was a four-alarm fire. The post fire department came to throw water and save as many of the bowls as possible. Everything was in a terribel state of confusion; everybody joined in an effort to extinguish the flames. Three civilians were on the latrine roof with the hose in their hands. The water was turned on; the men couldn't hold the hose. The man nearest the nozzle whirled and landed on his belly. His mouth opened and his teeth dropped into the fire below. This man filed claim against the U.S. Government for the cost of his teeth. The claims section went into action, trying to appraise the teeth that were consumed by the flames. The toothless man was a former British soldier and was stationed in Jerusalem at the time his teeth were made. The dentist could not be reached. However, he had only lost his "uppers," the "lowers" were carefully assessed for quality, wear and tear and so a just compensation was estimated for his "uppers." Why all this trouble over a few teeth anyhow? Well, wherever the American have been, they have left a long, long trail behind them. Part of this trail keeps winding, and when the spring is released the dust begins to fly. The I-B Theater keeps a large staff of technicians under the heading of the Claims Section of the Judge Advocate General's office, commanded by Lt. Col. Loos, to keep the world free from American dust. SWEATER TITLIST Janis Carter has been named the 1946 motion picture sweater girl. Regardless of the excuse, we would still run this photo. They do not solicit claims. All claims must be properly filed, then investigated, and tried by experienced officers, the presiding jury being the Foreign Claims Commission. Mostly all the investigators I interviewed agree on one point: Not so many of the claims are false but the majority are greatly exaggerated. A specific case is where the claimant filed for $50,000. After a just investigation of his case, he was finally awarded $500. The majority of the cases are traffic accidents and hunting calamities. You might be surprised to learn the actual cost of human life here in India. The value is placed solely on the earning capacity of the individual. Youngsters who have no income to the age of 10 are apportionaed 200 rupees; 10 to 15 years old are awarded 400 rupees; and with mature bread-winners the evaluation rarely exceeds a thousand. Here is an unusual claim: A marriageable young lady was medically prognosed sterile due to an injury incurred in a jeep accident. Her father proceeded to enter a claim against the Army, but not for the cost of the injuries or the hospital bills. His argument was that a sterile girl requires a larger dowery and he wanted the U.S. to pay the additional dowery money. And then there is the story of the GI's who wanted a change of diet. They decided to go fishing and stuffed their pockets with dynamite. After the explosion the dead fish floated to the surface. The hungry soldiers made off with the larger fish. It was an unusual problem for the Claims Department because no one knew how many fish they took. The mother who was nursing her child on a sharp curve in the road . . . The civilians who stole polished brass and learned much to their dismay after the explosion that they had walked off with TNT . . . The pregnant woman who had a miscarriage resulting from a bombing raid, filed a claim because the Army failed to shoot down the enemy planes. Maj. Nelson tells this one as his favorite. It happened during his stay in Africa. See if you can figure out the logic. A French jeweler filed a claim to the U.S. for property stolen from him by Arabs. His theory for the claims was the allegation that GI's had been so generous with the Arabs - taught them easy living - resulting in stealing rather than working. TIDAL WAVE A sure antidote for tidal wave fears is actress Yvonne DeCarlo. She's one reason ocean swimming is so popular in Southern California. HONOLULU - (UP) - Maj. Gen. Claire Chennault, who has just completed a four-months' investigation in China, charged this week that Soviet Russia was supplying military equipment to the Chinese Communists in their fight against the Kuomintang (Central) government. Chennault, who retired from the Army after leading the "Flying Tigers" in China, stopped in Honolulu briefly before leaving for Washington to report his findings. "The Communists are plentifully supplied and their equipment is getting increasingly better," he said. "They have no factories where equipment may be manufactured - and the equipment and supplies are not coming from Heaven - so they must be coming from Russia, according to the strong evidence I've been able to accumulate," the general stated. Inspector Charlie Ford, head of Calcutta Police Detective Department, sits beside me in the broad leather-smelling expanse of a closed-in taxi, honking perilously down the long lighted stretch of Harrison Road. Lights are winking on the stalls in the bazaars; a bale of silks shimmers like a red lambent flame; blown across the face of half a city comes the familiar pervasive odor of sandalwood and drains - the smell of "rottenness twice rotted" that Rudyard Kipling knew. This is my night out to howl with the Calcutta Police. We are going to Kalibagan. One minute the flicker of the streets is around us; the half pint skyscraper of the Burra Bazaar telephone exchange, where rumor has it Dottie Lamour once worked, looms heavy against the night sky. Then we are swallowed up in darkness. This is Kalibagan, the criminal quarter of Calcutta, the twilight bustee world of killers and thieves where, in course of time, all the goons come home to rest. We are five minutes away from Central Avenue; by jeep we are ten minutes from the Hinusthan Building. We stumble unevenly over rutted ground. The stench rises up to hit you like something out of this world; Bullocks sprawl among the cess, chinks of light peer from mud-thatched dwellings. In the farthest corners watching figures stood like ramrods in the gloom, slinking away at our approach. Charlie Ford keeps a staunch hold on the roscoe in his pocket. You never know with Kalibagan. What do you see? You don't see a thing. This is any other dark and dirty street, although a little "more than somewhat," as Runyon has it. But nobody here does anything beyond plot. They huddle by the sidewalk as they huddled when we went past thinking up thuggery. Calcutta has a business quarter, a shopping center; just as assuredly she has a criminal quarter. Nobody has ever questioned the fitness of this. But it comes as something of a shock to find that more people have been hanged from this one street than from any other quarter of Calcutta. Crime, says Charlie Ford, is easy to detect. Most of the criminals have one-track minds. A gang occupying a bustee hut in the center of Kalibagan may specialize in lifting silverware from the houses of wealthy Bengali merchants. Their favorite mode of entry is forcing a window. Given that much they will go right on forcing the window even with the front door left open. Even with a gold watch on the sideboard they would still settle for the silver. Deduction becomes relatively simple. The gumshoes of the Empire's Second City spot their man's trademark, arrest him in kalibagan within twenty-four hours. He wouldn't think of hiding out elsewhere. Where else would a criminal hide but the criminal quarter? I was dismissing the whole cahoot of Calcutta's criminals as a pack of meatballs when Charlie Ford turned around at the corner of a narrow alley to shoo away a crowd of the over-curious. Said he casually: "You'd never have got down here without me. They don't like strangers here." I looked back again at the motionless dhoti-draped figures, rigid and impenetrable as hate, against the backdrop of middens and darkness. Suddenly my contempt was gone with the wind. I guessed he was right.